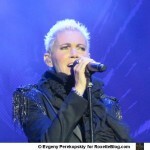 It was a windy and cold night in Norwegian Stavanger on August 21st when Roxette performed in front of over 8,000 people. In fact it was unforgettable evening even for nature as the beach where the gig took place was so destroyed during the concert that it is very probable that there will be no Summer Festival out there next year. Truely magnificent gig in Stavanger. Thanx everyone for making life sweet!!!! Marie was great. Her hi-lites were Halmstad, Stavanger and St. Peter. Spanish fan team decided to record everything on tape (high quality one! :), but there was some minor problems and that is the reason why the first two songs – “Dressed for success” and “Sleeping in my car” are missing. Anyway – sweet sixteen from Stavanger only for you on RXB. To avoid problems with torrents, Spaniards uploaded all the clips on megaupload service. It’s almost 7 GB! 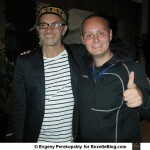 The story of Stavanger gig from our Russian reader – Evgeny Perekopskiy. It all started some months ago, when I happened to get one of the last tickets to the Stavanger gig. I was shocked at the price of postage (nearly 10 euros) and if you know how fast our Russian post is, then, without a doubt, you will understand me how nervously I was waiting for my ticket to arrive. On August 20th, I had to take four (!!!) flights to reach Stavanger and this I did 🙂 Csaba met me in Stavanger and gave me my ticket. Next morning I went to meet Laura who was staying at the Radisson Blue Atlantic Hotel. 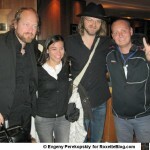 When I met her, she said that Marie and Per were also staying there. What a nice coincidence! 🙂 Later in the lobby I met two German fans, Tina and Anja, and three Argentinean fans, Silvana, Lionel and his wife Brenda. We were sitting and waiting for someone from rox related to come. Soon Oscar and Josefin came to the receptionist to order breakfast. Oscar recognized me and we chatted a bit. 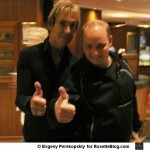 security woman asked us to move to another area because Roxette were going to rehearse. When we moved, we saw Per arriving with his wife Åsa. Per was holding a bunch of red roses. They were for Åsa, of course, to celebrate their 17th wedding anniversary. 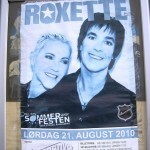 Roxette started their rehearsal at around 4 o’clock. They played: ‘The Big L.’, ‘Opportunity Nox’, ‘Fading like a flower’, ‘Silver Blue’, ‘Church of your heart’, ‘7twenty7’ and ‘Dressed for success’. After they finished rehearsing, the security team made four entrances, two for VIP visitors and two for ordinary ticket holders. 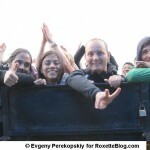 At 5.30 pm they opened the gates and fans ran as fast as they could. Luckily, I was standing near the front of Marie’s micro. Then I went to see what they served for VIP guests. There were some salads; fruit, fried meat, delicious shrimp and other dishes. I had some food and took some bananas for my friends who were sitting on the front row 🙂 The support act – Paperboys – a Norwegian hip-hop band started to play at around seven o’clock. They played very well and I saw the audience liked them a lot and knew the lyrics singing along the whole session. The clouds became grayer and grayer. It was damn cold and windy. I wasn’t thinking about myself, I was thinking about how Marie would manage to conquer the wild wind. 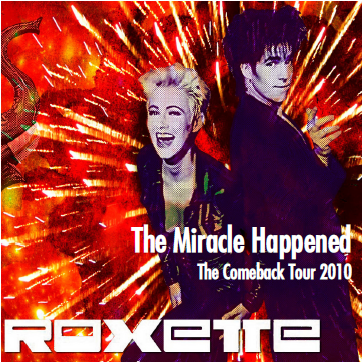 Roxette went on stage at around nine in the evening. After selling out with 8,000 tickets in only 1 week the Stavanger Artist Agency is looking forward to Roxette’s local concert on August 21. The picture on Rogalands Avis (Norwegian) says it all.